I just got this knife and it is awesome . Well made with a butcher knife stile super strong blade . Love it well worth the price and you get two so that even better . Would recommend to anyone looking for a good knife . 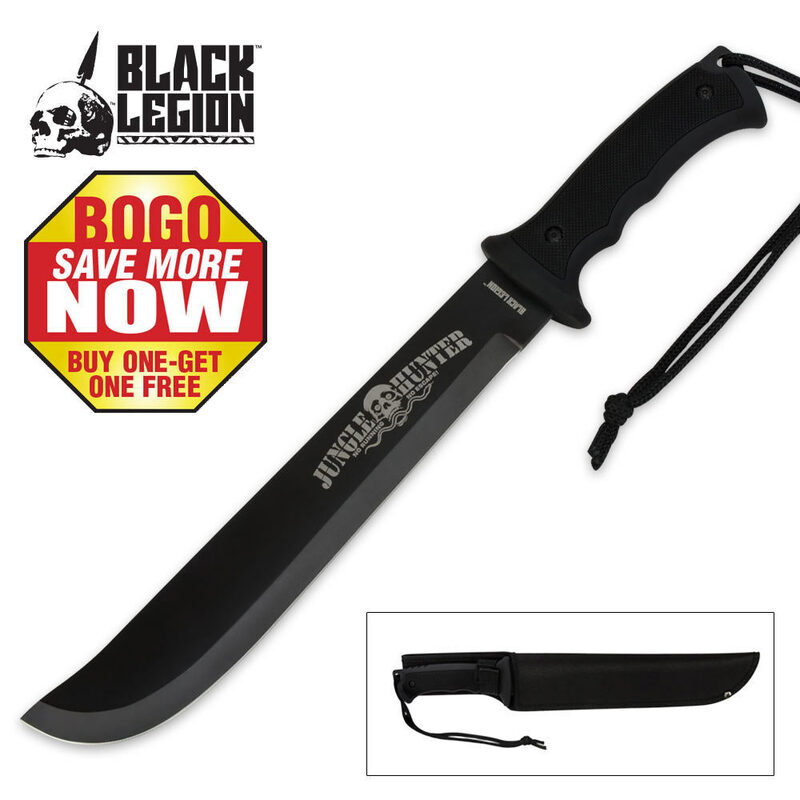 This machete came sharp out of the box,has a durable handle with a good feel,and a thick blade that can take a beating.You can't beat it for the price plus I got it on Bogo with free shipping at the time.I strongly recommend this machete. Getting these on the BOGO sale is an awesome deal! Very dense construction and they seem like they should take a beating. I really like the blade etching! I GOT TWO OF THESE ON BOGO SALE. I WISH I WOULD HAVE ORDERED FOUR SETS AT BOGO SALE. THIS IS LIKE A MINI MACHETTE. I LOVE THE STYLE AND FEEL OF THE HANDLE. PLUS IT HAS A SKULL LOGO ON THE BLADE. ( SO NATURALLY I HAD TO GET THEM )MY OLD LADY DIGS HERS TOO. Somewhat smaller than what I had imagined, but a solid piece of steel. Comes sharp right out of the box, handle has a nice feel, very good weight balance, and has a durable sheath. You can't beat it for $10. Especially if you get them on bogo like I did. Planning on ordering a couple more. I was surprised when I received this machete style knife by the quality and thickness of the blade. The blade is full tang and is 9/64 (.141) thick which makes for a hefty blade and it's sharp! Tarzan would love to have one of these! Jane too! The sheath is fairly well made and and though made in China I would rate the knife and sheath a cut above from what you would expect from China. The grip is comfortable and strongly attached to the full tang. Better yet because I got it on a two for one sale with free shipping, what a deal! Bud K makes me feel like a thief! I will use this for clearing a camp site when backpacking and for personal protection as well... Happy trails. Bought this in the bogo sale for ten bucks and I'm happy with the knives. They're pretty solid knives, one-eighth an inch thick, and weigh a little over 11 and half oz. the knife also has a kind of spike on the end of the handle that can be used as a glass breaker. As for the sheath it is alright, the knife fits snug in there but the only problem I have with the sheath is it uses Velcro to keep the knife in the sheath. The handle is pretty small wouldn't recommend to people with big hands cause the handle gets harder to get a grip on with bigger hands. Would recommend to people with small to medium hands.